I’ve been a mother for about six months now. Technically speaking that is. I haven’t had to discipline anyone or feed anyone yet – in fact, my child hopefully won’t be making its appearance into the outside world until late November. Being a mother is not the end all or sum of my identity. Transitioning into this new phase of life is already thought-consuming. And it doesn’t really take up any of my time at this point. So I can see, when my days are taken up with diaper changes, feedings, and laundry, and when a “good day” is one when I succeed in keeping a baby on a sane sleep schedule, how it would be easy to find my life’s meaning in my role as mother and caretaker. What I invest most in is what I tend to want to find my identity in. Recently it’s my job. In a few months it may be my child. When these roles are going well, I feel ok about myself. When something doesn’t go how I’ve planned (a worship service or a sleep schedule), I am tempted to feel like a failure as a person. I want to be careful to find my identity first as a child of God, not as mother or wife or worship director. I don’t have to be like other moms. I don’t know if everyone else feels like an uncreative loser when they browse Pinterest, but I certainly do. I finally signed up for Pinterest so I could search for nursery ideas. M.i.s.t.a.k.e. I’m already having to let go of the desire to be the most creative, craftsy, put-together mom, due in part to my limitations. We don’t own a home, so as a renter I’m not going to be painting nursery murals or drilling creative shelving units in the walls. Our apartment isn’t huge, so we’re not going to have a different baby carrier for every day or stroller for every occasion or wheel combination. In that way, limitations are helpful. They make me unable to do or buy everything I otherwise might be tempted to do or buy. They teach me early on – peer pressure in the parenting world is as real as in the middle school cafeteria. And I don’t have to measure up. I will make mistakes. I already have. Like the time our staff lunch featured Panera sandwich platters. After touching every single one trying to find one without deli meat (who knew, you’re not supposed to have lunch meat while pregnant), I finally found the only veggie sandwich. Proud of my find and in mid-conversation, I swallowed my first big bite before realizing my veggie sandwich was laden with alfalfa sprouts (apparently another no-no). Or the time when I ate three or four brownies for dinner, knowing full well my doctor’s instructions about eating healthily.. I’ve already messed up, and my kid hasn’t taken his first breath yet. So I should get used to it – not as an excuse to not try, but as preparation for learning to give, ask for, and receive grace and forgiveness. As preparation for learning to rely on God, not my ability to do things right. Remember my deepest desires when the smaller desires clamor for attention. What do I pray most for right now? For a child who follows Jesus and is healthy. In that order. When I struggle with his decisions about eating vegetables or college majors, when I wish he’d gotten more of his dad’s athletic prowess and less of his mother’s clumsiness, when it’s tempting to get absorbed in the little things, I want to remember those deepest prayers. Life is a miracle. Worth thanksgiving. Yep – cliché. But it’s amazing to me that I – more of a ‘liberal arts’ student who would struggle following directions for a high school science experiment – can apparently make a human without really thinking about it. The way God has designed our bodies and our instincts is incredible. Reading about labor and all the things that happen exactly as a baby is born – from heart chambers re-channeling to lungs working for the first time – it’s mind-blowing. 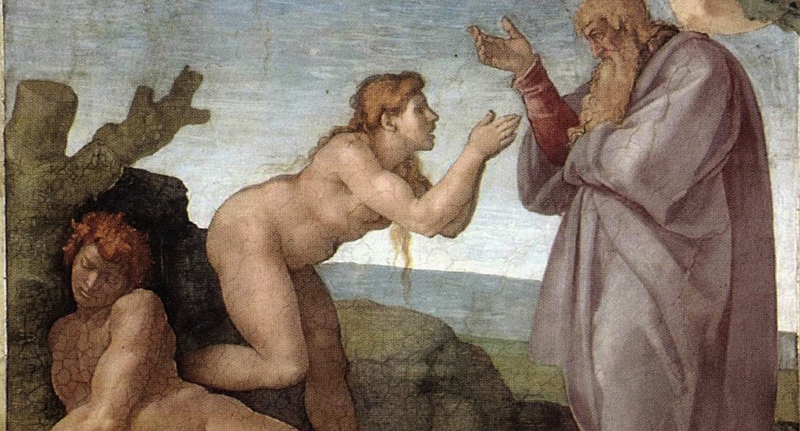 When I visited the Sistine Chapel, I remember being struck by the depiction of the creation of Eve. Eve is sort of bowing, with her hands outstretched and cupped in a receptive way. It’s like she understands that creation itself (even pre-fall) is an act of grace, a sheer gift. Truly, he gives us life, breath, and everything else. And even in a fallen world, it’s worth thanksgiving. This point is a sober one for me as well, as I have so many dear friends who would love to receive a new life into their family, and have thus far struggled to do so. The church must strive to be a place that both celebrates and mourns with its members well – a safe place for those waiting in unanswered prayer. So in sum, I am quickly learning everything I’ll need to know about being a mother. <That was a joke.> I do not know what the future holds – the trials and tears and joys that will Lord-willing be part of bringing a new life into this world. But I pray I’ll hold fast to the God who has already numbered my days, and my son’s, and has known us both before either of us came to be.